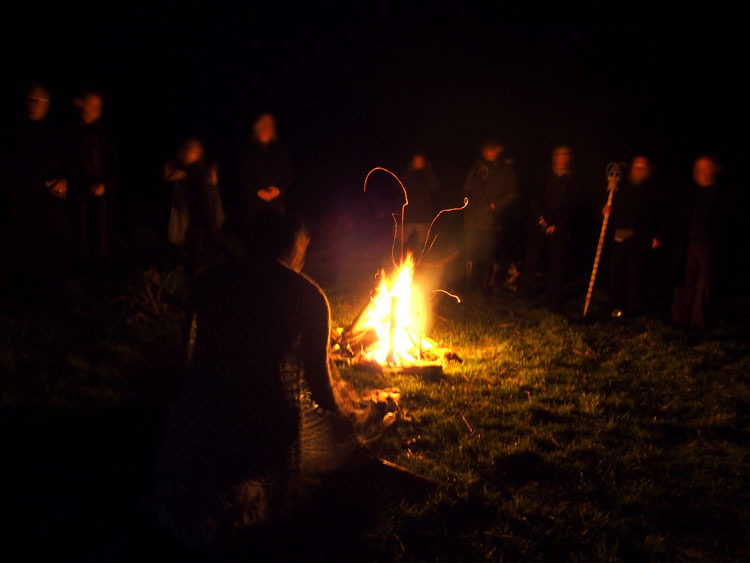 Pagans and occultists from across West Cornwall and beyond gathered together near St Just, to celebrate the Hallows, Samhain, or Allantide/Kalan Gwav as it was known in Cornwall. Our ritual began under a clear night sky around the bonfire where we contemplated and communed with the place, the season and the descent of the ‘fire of the land’ into the earth. The circle was exorcised by the sweeping of the besom, and cast in the way that has become traditional for the moot. As some pagan and magical traditions have varying quarter-element associations, I had decided that we would bless our circle with the virtues of the elements in a ‘hands on’ manner that was not direction specific. On a small altar beside the fire we had physical representations of each of the elements – A lantern for fire, a large hag stone for earth, a chalice of water for water and a censer of incense for air. Each of these would be carried around the circle by volunteers with simple invocations unto the elements. 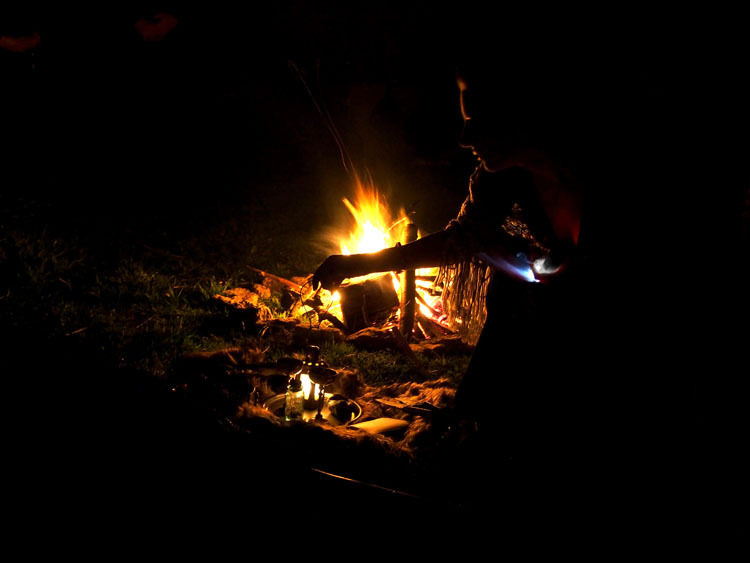 The Goddess and God were also called to our circle, most appropriately by a married couple, facing each other across the fire who invoked their seasonal aspects – the Dark Mother and Lord of the Hunt. Before we called to our beloved dead, we ourselves contemplated death within us, our ‘cutting away’ from the ‘everyday’ world for the duration of our rite, and all those outworn and limiting aspects of our lives we wished to shed in death. As we did this, I paced slowly, around the outside of the circle, repeatedly shutting and opening an old pair of iron shears, symbolic of death and the severances we were contemplating. A bowl, containing a mixture of Yew, Mugwort and Myrrh, substances of the dead and of vision, was held aloft the fire as the ‘way between the worlds’ was opened and the ancestors invited to join our celebration. Each of us then in turn offered some of the bowl’s content to the fire, naming our beloved dead as the fresh Yew sprigs crackled and snapped in the flames. 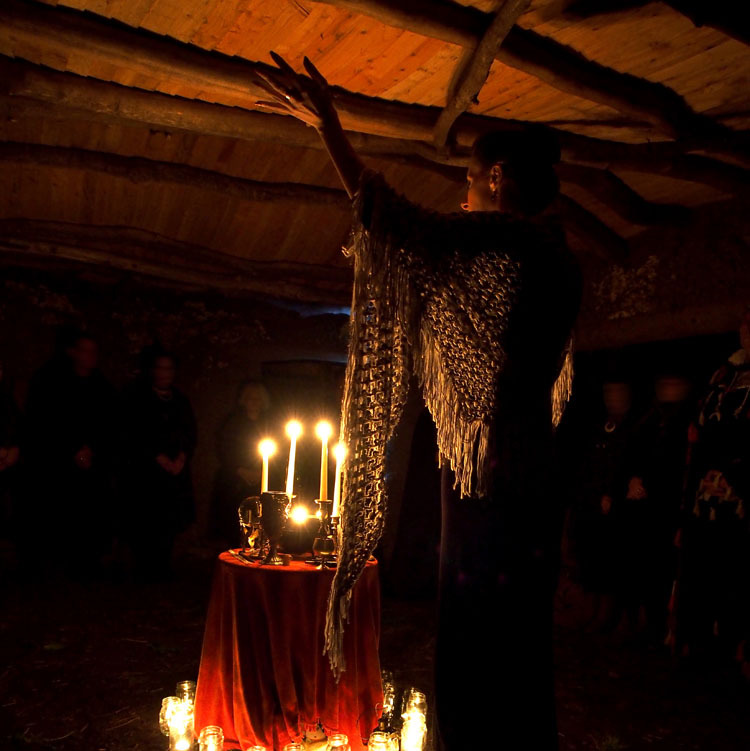 We then joined hands for a double spiral serpent dance, with the spirits, and following the telluric flame held within the lantern around the fire, and then into the beautiful cob-built round hut, which for our rite served symbolically as the Otherworld. Our journey was accompanied by a slow and hypnotic drum beat, and the otherworldly drone of a shruti box, until we were gathered around the small central altar. Where hunt the faery hounds. By the light of this gentle flame we spent time in silent communion with our ancestors before other candles were lit from the cauldron candle; filling the Otherworld cob-hut with golden light, for in death we affirm and celebrate life, and the inner fire must be fed, nurtured and kindled throughout the Winter-tide rest and withdrawal, so that it may emerge with greater strength in the Spring. Sarah and Dave blessed the libation as well as performing a protective blessing for the cob-hut, as we were the first group to use this truly beautiful new building. Time for celebration was given to the fact that the moot was now 21 years old; making it what is believed to be the UK’s oldest pagan moot. 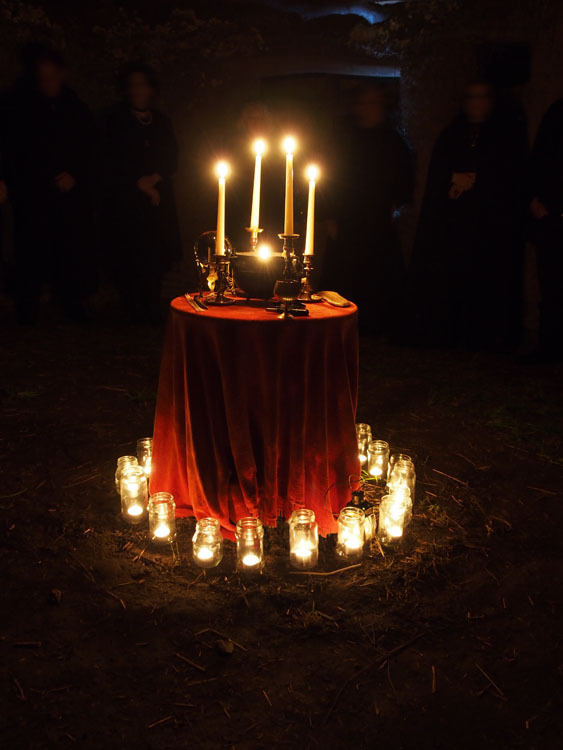 A blessing both beautiful and moving was read prior to the close of the Samhain rite, as has become the moot’s tradition. It had been written by Gesine, a much loved and greatly missed friend of the moot, now in the Summerlands. The local tradition of exchanging ‘Allan Apples’ for good luck and prophetic dreams was also observed, as each participant brought with them a red apple. These were placed within a large cauldron inside the cob-hut before the ritual, so that each of us could take one from it at the end of the rite to place beside our beds at home. The night was then given to celebration of the pagan New Year with fire-sparklers, feasting and drumming around the fire, and the appearance of ‘Ramesses’ the black tattered and gilded ram skull ‘oss of Penzance’s winter guising customs, who performed a wild dance about the fire before disappearing into the darkness.